The student award is yet to be announced. A 100%-polymer aerogel which easily incorporated into composites, its benefits derive from its all-polymer construction combined with its porous aerogel internal structure that prevents heat transfer and simultaneously provides high strength, compression resistance, toughness, cleanliness and an easy-bonding surface. Blueshift discovered the original laboratory process to make prototype polymer aerogels on a laboratory benchtop. However, scaling this process to production sizes and quantities to make this novel material was challenging because the material is different than other composite core materials and also unlike all the other existing silica-based aerogel materials. AeroZero is not manufacturable with existing processes and techniques. In order to reach an economically viable commercial scale, several novel manufacturing and processing steps were developed. The company has worked closely with clients in the oil & gas, aerospace, and automotive industries to launch a product that matched the needs of the market. Lightweighting is a theme that has prevailed throughout discussions with industry players (the density of this material is 0.15 g/cm3 or less, which is over 9 times lighter than traditional polyimides), and Blueshift has focused on optimizing the process to make a very low-density yet strong material. As a 100%-polyimide polymer construction, AeroZero eliminates dusting and does not require dangerous material handling protocols. Aerogels have long been desirable as a composite material because of their lightweight nature and high thermal insulating properties, but existing aerogels are made from particulate silica, which inhibits their adoption in composite structures. The primary value of the Blueshift AeroZero in composites is that it is a highly capable core material and is extremely easy to incorporate. The first innovation is a metallized glass fiber for the mobile industry. Either red or black tinted glass fiber is used to produce arear housing with the rich, deep and reflective appearance of a carbon composite in a beautiful antenna-friendly package. The main goals for the metallized glass fiber are to deliver a rich-looking woven fiber composite with the reflectivity and depth of a carbon composite that can be branded as ‘Kevlar strong’ for Verizon (the leading cellular service provider in the United States), as well as deliver a composite stack-up and forming technology that results in improved dimensional stability and surface quality (post-forming) to allow both a soft-feel (black) and low-gloss (red) cosmetic painting. 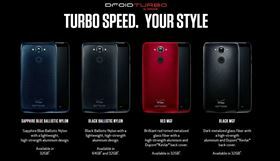 The second innovation is a ballistic nylon, which brings the look and feel of premium luggage to the mobile industry. It is reinforced with an industry-first metallized Kevlar and PC composite that is both antenna friendly and as tough as steel. The finished products deliver two thermoplastic composite laminates advertised as ‘Kevlar strong’, that combine nylon, polycarbonate, DuPont Kevlar and woven glass fiber. FiberCITY self-sustainable, high-throughput, comprehensive fiber grading capability has been developed to drive the industrial implementation of biocomposites by enabling control of their quality and consistency with the capacity to evaluate bio-fibers from multiple agricultural and natural sources, beginning with flax and hemp. FiberCITY has an integrated structure; although numerous instruments are currently used for fiber grading and characterization, they are non-comprehensive, non-integrated and are still far from achieving their full potential. The project integrates all of this equipment to develop a robust and holistic characterization system for natural fiber properties, and modelling, predicting and optimising their effects downstream in industrial processes. A standardized methodology to assess the sum total of the physical and biochemical attributes of biofibers, or ‘phenome’, will thus enable the rapid assessment and selection of superior fiber crops, facilitate premiums for high-quality fibers, assist in maintaining quality (variability) control from crop to crop, and provide a means for industry to model and assess the performance of different biomass processing techniques – creating a new ‘intelligent fiber’ paradigm. FiberCITY will manage and mine its data output (likely in the terabyte range) using a highly specified laboratory information management system (LIMS). LIMS is used in pharmaceutical and other testing laboratories where large volumes of data are generated in an environment of strict regulation and quality control. Using a LIMS will enable FiberCITY to establish international standardized test methods (e.g. determination of flax fiber cellulose fibril angle by polarised Raman spectroscopy) working through the Composites Innovation Center’s membership on the ASTM D13.17 committee, giving a strong North American presence and through international standards collaborations, initially with China. 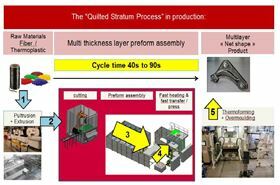 The Quilted Stratum Process (QSP) provides net-shape parts that are ready for assembly in very short cycle times for high-volume capacity, with repeatable quality, robustness and global cost efficiency. The QSP results from three concepts. The first one consists in a global process integration: from raw materials to the finished part. The added value focuses on the final part, no semi-products procurement, as much automation as possible, and a maximum capacity of standardization of raw materials for a worldwide procurement capability. The second concept consists in giving priority to production performance: cost and cycle time become drivers for the design of the part. For a given cost and cycle time performance, the material will have a predictable level of defects, making it possible to obtain the material's characteristics and to establish suitable rules and methods for robust designing. Finally, the last concept revolves around designing multi-materials and net-shape preforms for net-shape final parts with the right material at the right place and no loss of material. This fully integrated new concept reaches the goal of simultaneously combining high performance, low cost and short cycle times. The partners of this project came up with the concept two years ago and now provide an automatic production line ready to develop and produce industrial prototypes for the automotive and aeronautic markets. With a revolutionary new and patent-pending insert, RUAG Space has been able to automate the placement of inserts into composite sandwich panels for satellites. As a result, manufacturing time and costs can be reduced significantly and the new process requires less potting compound to glue the insert into the panel, which results in less launching mass. In the design of spacecraft structures, weight and stiffness are critical parameters and, as a result, composite sandwich panels are often used. A typical communication satellite has more than 2,500 inserts. Up until now, the space industry has been using manual processes to place these inserts. RUAG’s breakthrough innovation involves the insert itself, the process and a newly developed machine called the RUAG Automated Potting Machine (APM). The machine shapes the panel, drills the insert holes, applies the adhesive to the insert, places the insert into the panel and produces a final test report summarizing the relevant process parameters for every single insert. These activities were previously all done in individual steps on different machines in different locations, involving a high amount of manual labour. This innovation significantly reduces the throughput time and total cost of composite sandwich panels, while it increases flexibility for customers to modify insert patterns late in the process. In addition, the automated process will eliminate the potential errors linked to manual processes and increase the precision of the insert location. Bcomp has developed the powerRibs patented technology, which has a higher performance-per-price ratio than standard composites currently on the market. For a given performance, this technology allows to decrease weight by up to 50% while simultaneously cutting costs, which is of particular interest for the automotive sector. The reinforcement material can be combined with all types of structural materials, such as carbon-fiber composites, glass-fiber composites or non-woven natural-fiber composites, but also any type of sheet metal alloys. For a given flexural stiffness, the weight of a reference carbon composite plate can be reduced by 27% with a cost lowered by 40 % when the carbon-fiber parts are replaced by powerRibs. When compared to a full glass-fiber composite plate, cost can still be reduced by approximately 30% while cutting over 40% of the weight for the same performance. This combination of high flexural stiffness and damping is suitable for a wide range of applications in the sports & leisure industry (kayak hulls, bicycle frames) but especially in the automotive industry with the current strong drive for light-weighting and high-performance bio-sourced materials. This innovation can be used for both automotive interior semi-structural shell elements (door panels, seat backs, front panels) and exterior body parts (roofs, fenders, etc.). In addition to its collaboration with ESA, Bcomp has launched collaborations with several players in the automotive industry, namely a leading tool manufacturer and several Tier 1 suppliers and OEMs. The process of repairing FRP structures begins with the removal of the damaged areas and the application of single patch layers or a hardened repair piece (patch). Most repair methods require a heat source to harden either the entire patch or the adhesive layer through a heating cycle. 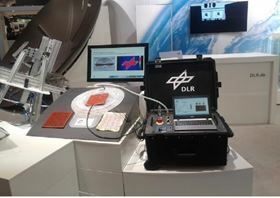 The repair concept developed by the German Aerospace Center (Institute of Structures and Design in Stuttgart) uses inductively-heated metal pressure sheets. An induction coil is used to generate an alternating electromagnetic field that heats the metal sheet. The sheet is pressed onto the patch with the aid of a vacuum bag and binds the patch to the surrounding structure through pressure and heat. The new repair technology provides greater flexibility when integrating the patch than the standard technology previously used. With an oven or autoclave, the entire component is heated. Although heat blankets, infrared lamps and hot air systems can be used to heat smaller areas of a structure, they cannot specifically heat only the area to be repaired. The inductively-heated metal pressure sheet, on the other hand, can be precisely adapted to the different geometric dimensions of an area in need of repair. 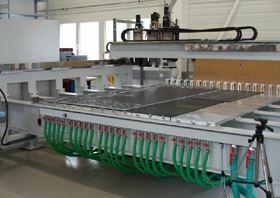 The main benefits include heating rates of up to 65°C/minute, if required; the ability to repair high-performance thermoplastics (temperatures of over 300°C are possible by separating the induction coil and the heated metal sheet); and precise, localised heating of only the areas in need of repair. To demonstrate the great potential of the developed technology, a mobile repair station was built. This station provides all the systems needed to repair FRP structures. In addition to the system technology for creating the alternating electromagnetic field, the repair station also includes a vacuum pump for applying the necessary pressure to the patch. A netbook was added to manage the systems and control the individual processes via a resistance thermometer and a flowmeter. Within the scope of the CAMISMA (carbon amid metal based interior structure using a multi-material system approach) project conducted by the German Ministry of Education and Research (BMBF), a consortium of industrial and academic partners responds to customers’ need for lightweight components and materials recycling. The result is the CAMISMA multi-material concept, which uses carbon fibers in combination with a thermoplastic matrix, a mixed carbon- and glass-fiber composite and a metal insert with a special adhesion promoter in one part. This enables the integration of multiple functions in a single part (comparable to approximately 12 parts in conventional construction). In addition, process waste can be reduced to below 5% of the material used, compared with current carbon part production, where approximately 50% of the material ends up as waste. Target applications for this technology are series production cars, especially vehicles with a lightweight focus such as electric cars, lightweight city cars and sports cars. This unique technology makes multi-material structures affordable for mass production applications (>200,000 units/year) by intelligently combining four different materials in a tailored design, using weight- and cost-optimized processes including new joining methods, and reducing waste. A pending patent for the connection of a mechanism in a fiber-reinforced seat backrest structure demonstrates the novelty of the approach for new joining and combining methods. The concept has the potential to meet the very challenging OEM requirements regarding a cost/weight ratio superior to +€5 per saved kg. For these reasons, this innovation will expand the use of lightweight and sustainable materials normally used in very limited amounts for select high-class models, and significantly reduce fuel consumption and overall CO2 emissions, while extending the range of electric vehicles. All-composite raw materials and intermediate products (e.g. preforms) inherit tolerances that have to be considered in the production specifications. Today, the typical way of solving this problem is to define a quite conservative, invariable production corridor based on worst-case assumptions and indirect production parameters such as time, pressure and temperature. These invariable production cycle parameters are often derived from extensive trials and possess high safety margins, i.e. long tempering cycles in order to secure sufficient cure. By using a mould-integrated network of ultrasound (US) sensors, it is possible to monitor and subsequently directly adjust quality-determining process parameters such as resin flow (ensuring void-free laminates), laminate thickness and cure progress in open-mould LCM (liquid composite moulding) processes. The decisive advantage of US sensors is that they do not affect the critical mould line or vacuum integrity since they are installed on the accessible backside of the mould. The US sensor feedback-based production approach uses direct laminate parameters that describe the individual production process with all its deviations from the nominal process. As a result, US sensor readings can be used initially to validate the process parameters (Vf, resin arrival, etc.) and ultimately to adjust production parameters during the process, or at least correct the parameter settings for the next shot, which helps to significantly improve the repeatability of product properties, reduce scrap rates and shorten production cycles. In the last phase of development, the collaboration with structural health monitoring (SHM) experts significantly helped to proceed since SHM technology options have very much in common with the described innovative controlled production approach. The current level of technology readiness was demonstrated in the LOCOMACHS FP7 project, where two ribs were produced in an autoclave injection technology. The ribs where derived from existing ribs of a full-size demonstrator wing. When fully developed, they have the potential to be introduced in production, e.g. in processes such as the Bombardier Aerospace UK autoclave-based RTI (resin transfer injection) process. Continuous fiber-reinforced composites (CFRP) are increasingly being used in the aerospace and automotive industries to cope with lightweighting challenges and meet high performance standards. Thanks to their unique combination of stiffness, strength and density, CFRP open up new design possibilities to engineers. 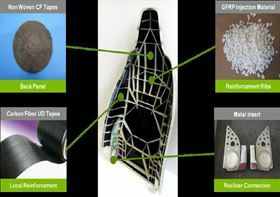 However, this material potential comes with a price to pay: the complexity to identify all the possibilities offered by a given composite material system. The design space is dictated by the choice of the laminate ply layup. Carpet plots have proven to be great tools in representing this design space, but require extensive experimental testing to feed the map. Virtually, hundreds or thousands of layup combinations could be imagined and tested. There is a need to reduce the amount of physical testing required to grasp the whole picture of a given material system. Physical testing of composite laminate coupons requires a huge amount of money and time, in addition to the associated waste of energy. This situation is hindering the acceleration of composites development in the aerospace and automotive industries. As an answer to these issues, e-Xstream Engineering has developed Digimat-VA, a unique software solution dedicated to accurate virtual characterization of composites. Digimat-VA, which stands for Virtual Allowables, offers a dedicated integrated workflow starting from easy and efficient creation of advanced multi-scale material models (including micro-level variability) and FEA simulations of typical test coupons, and ending with dedicated automatic post-processing which computes mean stiffness, strength and B-basis values (statistical values). Full lay-up design space can be explored at the fraction of the usual cost. Generating a property distribution without extensive experimental work is now just a few clicks away and allows to define the allowables test matrix for any combination of CFRP materials, lay-ups, environment conditions and type of coupon tests, prepare and run the virtual tests, post-process results and generate a customized report. It is powered by a non-linear FEA solver coupled with the Digimat multi-scale modelling non-linear finite element solver and Digimat progressive failure modelling. 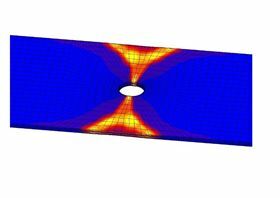 Root cause analysis of early failure can now be understood thanks to the variability modelling integrated in Digimat-VA. New material systems can now be explored virtually.